The Oberoi Amarvilâs Hotel's all 112 rooms offer unmatched views of the Taj Mahal.All rooms and suites feature a separate walk-in closet with electronic safe, color satellite TV, DVD/CD player. Minibar and a facility to make tea and coffee. Beautiful marble bathrooms feature both a bathtub and a separate shower cubicle with deluxe toiletries. Fifty-seven Deluxe Rooms have a private open-air terrace. Four Executive Suites have a separate living room and bedroom. The two luxury suites feature in addition, a separate living/dining room with butler’s pantry and private open air terrace. The bathroom overlooks the Taj Mahal. Guest can lose themselves in comfort in any of our 100 rooms including five executive suites. Stylish and comfortable, all guestrooms at Taj View Hotel evoke the beauty of the Taj Mahal itself, as well as offering uninterrupted view of it. All of the well appointed rooms open onto meticulously landscaped gardens and the pool. Standard Rooms are Light, airy, and modern, these rooms are well equipped with guest amenities including international direct dial facility, Broadband hi-speed Internet access, channel music, mini-bar, hair dryer, and tea/coffee maker. Taj-facing Rooms include all the above amenities as well as gorgeous views of the Taj Mahal. Gloriously stretching over 35 acres of vibrant courtyards and situated in the heart of the city, the award-winning Mughal Sheraton offers 285 luxuriously furnished rooms and suites. All guest rooms are decorated with a touch of old-world splendor, and many offer a view of the Taj Mahal, located just 2 kilometers away. Guests can dine in any of the on-site restaurants, serving authentic flavours of the North West Frontier, Continental or gourmet dishes. The hotel offers a choice of 5 convention halls,accommodating up to 750 people in theatre-style. Also, there is a fully equipped business centre with contemporary business facilities and secretarial services. 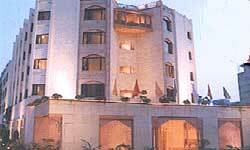 Hotel Jaypee Palace has 350 guest rooms including 12 suites and 40 Executive rooms. All the roms are centrally air - conditioned, well appointed and fully equipped with all the modern facilities like individual safe, electronic door lock, minibar, tea/coffee maker, waking up facility, iron and iron board, television with remote control and direct dial telephone. It has 138 elegantly furnished rooms that include rooms for the physically challenged, suites and a non-smoking section. All rooms are centrally air-conditioned and equipped with modern facilities like a mini-bar, complimentary tea and coffee making facility, direct dial telephone, data port connectivity, television set with satellite transmission and a personal safe.The hotel features a multi-cuisine informal Brasserie, a bar and a swimming pool Additional facilities include 24-hour Room Service, Fitness Centre, Travel desk, Beauty salon and Gift shop. Holiday Inn Hotel has 148 rooms and suites, each of which has been tastefully decorated to make the guests feel relaxed and comfortable. A tourist also has the choice of smoking and non-smoking rooms. All the rooms are equipped with facilities like cable TV, 4 channel music, mini bars, 24-hour satellite entertainment, hair dyer. Savor the exquisite culinary delights of different parts of the world. The multi cuisine Olive Garden Restaurant serves a unique blend of international cuisine with a seating capacity of 70 people overlooking the lush green front lawns of the Hotel Holiday Inn Agra. The Downtown Club bar is an idea venue to relax. For meetings and events that leave a lasting impression, Hotel Holiday Inn has a special attraction. From small meetings to big gathering, the Hotel Holiday Inn Agra makes every event a success. The Regent is ideal for gatherings of any size ranging from 50-1200 people. The Boardroom of the hotel is ideal for business meetings and can accommodate 15-40 people. Hotel Clarks Shiraz in Agra features 237 lavishly appointed and centrally air-conditioned rooms and suites including 90 Deluxe Doubles, 145 Standard Doubles and 2 Suites. All the rooms are meticulously decorated gives breathtaking view of the Taj Mahal. The hotel has 2 Restaurants & 2 Bars: Shehnaz Dining hall, Bansuri Coffee Shop, Mughal Room - Roof top restaurant over-looking the Taj Mahal, Khayyam Bar, Mughal Bar, Pool-side barbeque and Piano Lounge, Travel Agent, Airline Office, Shopping Arcade, Swimming Pool, Croquet, Mini Golf, Bank, CCTV , Safe Deposit Locker, Car Rental, Beauty Parlour, Credit Card Facility, Doctor on Call, 24 hours Room Service,Conference Facility, Swimming Pool, Clarks Health Spa, Barbeque, Piano Lounge, Bowling Alley, Billiards, Pool Tables, Go-Carting, Laundry Service. This 3 star Agra hotel has 100 elegantly furnished rooms with attached bath and modern communication systems. All rooms centrally air-conditioned and have telephone and channel music. The "Taj View Rooms" have been specially designed to provide stunning views of the Taj Mahal. For dining or lunches, there is the Sheesh Mahal, offering you mouth-watering delicacies. Then there is the bar-Tequila- and Ripples-the coffee shop. This 3 star Agra hotel has 51 well appointed rooms, each equipped with mini bar, TV, bathroom with phones, hair dryers besides bath tubs having running hot and cold water. The rooms with the Taj Mahal view makes you feel a part of that era. Copyright 2006 Bodaiju Tours (P) Ltd. All Rights Reserved.